A massively good cause which RacerX Gullwing supports in his own inimitable style. How does he support the American Cancer Society and make it fun for people? Giant Snail Cross Country Race!! Like a Marathon for the Giant Snail community the Cross Country Race pits 45 foot snail against 45 foot snail across 60 sims in a battle of endurance and grid stability. The actual sight of a large number of snails racing down the roads of mainland sims in Second Life is a sight to behold for passers by and the carnival feeling of it will bring smiles to both the young and the old. 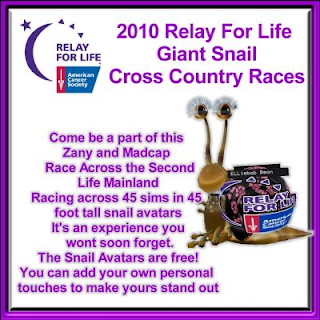 You can be involved with the Giant Snail Cross Country Race in more ways than one, you can either race (the next event is on April 17th and you can get your scarves at Aborholm, Abitibi in Second Life) There are different scarves available and they will ultimately place you on different sims at the start of the race. There is something new this time, for those who don't feel up to a marathon race dressed as a giant snail.. Here is the way you can be involved without having to be a snail. The sponsor would pledge so many L$ on a snail for each sim they went through. Depending on the place of the snail at the finish of the race the amount would be more. 7th...........................4L$, ect. to 1st place where the amount would be 10 L per sim for a maximum donation of 600L for the 60 sim race. So I'm looking for sponsors...IM me in world if you would like to sponsor me through the race...Again, I can't stress how much this is for a good cause, a few L$'s might mean very little to you, but every little helps.